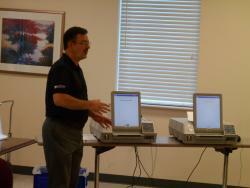 Don Whitman of ES&S demonstrates the Auto Mark Voting Machine at the 2018 Low Vision Awareness Day. V.I.P. 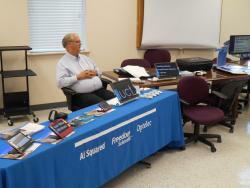 is a big supporter of using assistive technology. to live and play independently. Whitman says, " The Auto Mark can mark your ballot for you by pushing buttons or touching the screen." It is for the visually impaired, blind and handicapped to use to vote." Mike Self of Freedom Scientific speaks at the 2018 Low Vision Awareness Day. V.I.P. 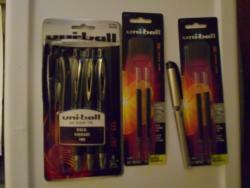 would like to promote the Uniball Pens. After about 18 years of research trying to find the perfect writing pen for the visually impaired. We finally found one that does the trick. It writes in bold black ink. It is a gel RT impact. No, 207. 1.0 bold ink. You can find them at most retail stores and office supply stores. The Visually Impaired People Organization, INC of Selma, Alabama will host a low vision awareness day on June 8, 2018 at the Dallas County Health Department in the community room. The health department is located at 100 Samuel O Moseley drive in Selma. The purpose of the event will bring low vision technology vendors and host consumers who need the technology, together under one roof. After 46 years, Dr. Julian P. Howell Jr. of Selma has retired. VIP honored him for all his years of service and recognized him for serving people with special needs. He is the founder of Selma Medical Associates. He listens to his patients and then treats them. He was a household name in the area. 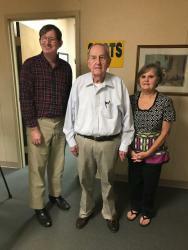 He is pictured with his nurse Marcia, alongside VIP CEO William Bowman. VIP CEO William Bowman honors the Selma Times Journal staff for its customer service and for writing a story about glaucoma screenings. 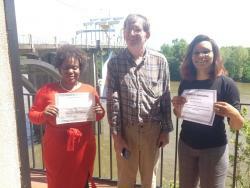 Onisha Blevins and Clara Gray both were recognized. VIP believes in thanking those who help support our cause. The staff does a great job serving the community.